Bill Kopka (fourth from the right) presents the $15,000 donation on behalf of Associated Bank to NeighborWorks Green Bay. 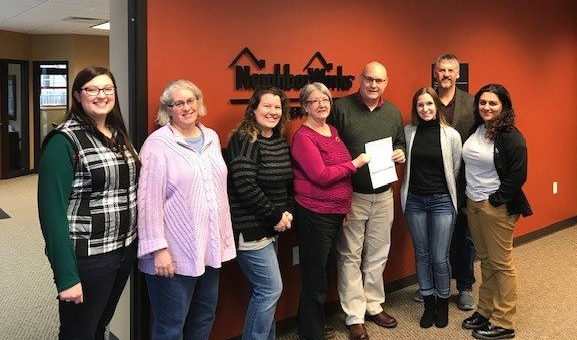 On behalf of Associated Bank, Bill Kopka, community accountability officer, recently presented a $15,000 donation to NeighborWorks Green Bay, an organization that provides housing revitalization and innovative homeownership solutions to individuals in the greater Green Bay area. “This contribution is just one example of how we’re investing in our communities and fostering programs that promote economic development in neighborhoods where we live and work,” said Kopka. The donation will benefit its annual Reframe Titletown initiative where free home maintenance and repairs are provided to elderly, low- to moderate-income and disabled individuals at no cost.